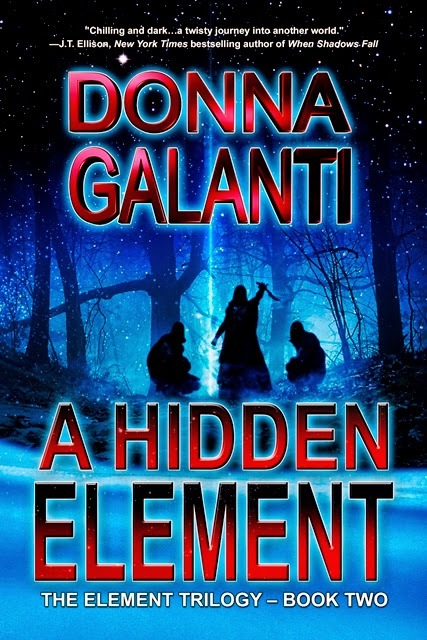 Check out this dark and alluring cover for A HIDDEN ELEMENT – book 2 in Donna Galanti’s Element Trilogy! This paranormal suspense officially hits shelves August 28th but you can pre-order it now! Get your dark on with more murder and mystery with a dash of steam. chat with cool author guests and giveaways! more feasting to be done with this awesome giveaway jam-packed with prizes! Enter A HIDDEN ELEMENT Release Giveaway here. grief as she searched the house for some sort of sign of where Charlie had gone. “Charlie,” she screamed. Something caught her eye on the floor of his room. Something that didn’t belong in their home. She snatched it up. A leather whip. Its handle was braided with nine leather strips tied to it. Red tinged the ends of the strips. She held it in her shaking hands and closed her eyes, not wanting to see the images it carried. But she had to. For her son. For Ben. THROUGH 8/31 FOR JUST $.99cents! photographer. She now lives in Pennsylvania with her family in an old farmhouse. It has lots of writing nooks, fireplaces, and stink bugs, but she’s still wishing for a castle again—preferably with ghosts. PLUS book 1 in The Element Trilogy is on sale today for just 99 cents and has 38 5-star reviews.